Download "b. The playing surface shall be free from any projections which a player could encounter in the course of play." 1 1 The Official Special Olympics Rules shall govern all Special Olympics Floor Hockey competitions. Special Olympics, Inc. is the International Governing Body for Floor Hockey. SECTION A - OFFICIAL EVENTS The following is a list of official events available in Special Olympics. The range of events is intended to offer competition opportunities for athletes of all abilities. Programs may determine the events offered and, if required, guidelines for the management of those events. Coaches are responsible for providing training and event selection appropriate to each athlete s skill and interest. 1. Individual Skills Contest 2. Team Competition 3. Unified Sports Team Competition SECTION B - FACILITIES 1. 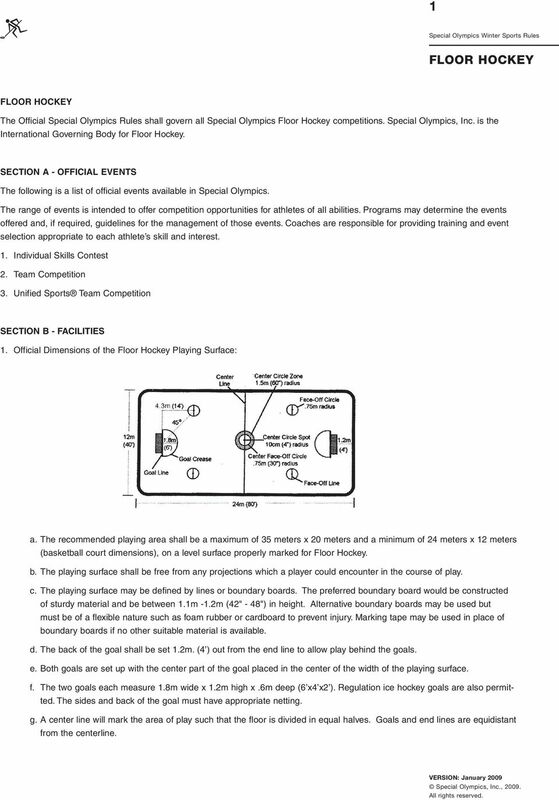 Official Dimensions of the Floor Hockey Playing Surface: a. The recommended playing area shall be a maximum of 35 meters x 20 meters and a minimum of 24 meters x 12 meters (basketball court dimensions), on a level surface properly marked for Floor Hockey. b. The playing surface shall be free from any projections which a player could encounter in the course of play. c. The playing surface may be defined by lines or boundary boards. The preferred boundary board would be constructed of sturdy material and be between 1.1m -1.2m (42" - 48") in height. Alternative boundary boards may be used but must be of a flexible nature such as foam rubber or cardboard to prevent injury. Marking tape may be used in place of boundary boards if no other suitable material is available. d. The back of the goal shall be set 1.2m. (4 ) out from the end line to allow play behind the goals. e. Both goals are set up with the center part of the goal placed in the center of the width of the playing surface. f. The two goals each measure 1.8m wide x 1.2m high x.6m deep (6 x4 x2 ). Regulation ice hockey goals are also permitted. The sides and back of the goal must have appropriate netting. g. A center line will mark the area of play such that the floor is divided in equal halves. Goals and end lines are equidistant from the centerline. 2 2 h. Center Circle Spot: a line 10cm (4") in length perpendicular to the center line or a circular spot 10cm (4") in radius to be marked in the center of the center face-off circle. i. Center Face-off Circle: a circle with a radius of.75m (30") and a line width of 5cm (2") to be marked outside the center circle spot. j. Face-Off Zone: a circle with a radius of 1.5 m (5 ) and a line 5cm (2") in width to be marked outside the center court face-off circle. k. Goal Line: a line 5cm (2") in width is drawn between the two goal posts of each goal and extend to the goal crease. l. Goal Crease: the goal crease is a semi-circle with a 1.8m (6 ) radius drawn from the center of the goal line. m.face-off Circles: face-off circles are marked with a circular spot of 10cm (4") in radius or a line of 10cm (4") in length in the center of each circle. There are two face-off circles in each half of the playing surface, each circle located at a 45 degree angle from the center of the goal line. The center face-off spot of each face-off circle is determined by measuring a point 4.3m (14 ) to the left or right of the center of the goal line, then measuring out 4.3m (14 ) from that point toward the center line. Each circle has a radius of.75m (30") and a line drawn through the center point of the face-off circle that is parallel to the center line. n. There shall be a designated penalty box area. SECTION C - EQUIPMENT 1. The puck is a circular felt disc with a center hole and has the following dimensions: a. Diameter: 20cm (8"). b. Center Hole: 10cm (4") may be reinforced with leather. c. Thickness: 2.5cm (1"). d. Weight: grams (5-8 ounces). 2. Sticks other than goalkeepers sticks must be a rod or dowel made of wood and/or fiberglass conforming to the following dimensions: a. Circumference: cm (3-4"). b. Length: cm (3-5 ). c. The non-handle end (i.e. the bottom or floor end) of all sticks other than goalkeepers sticks must be rounded-off. The stick must be of a uniform thickness over the entire length. No tape, string, or other object is allowed that will increase the diameter on the bottom of the stick. 3. The goalkeeper s stick shall be a regulation ice hockey goalkeeper s stick. The blade of the goalkeeper s stick must not exceed 8.9cm (3 1/2") in width at any point except at the heel where it must not exceed 11.4cm (41/2") in width; nor must the goalkeeper s stick exceed 39.3cm (15 1/2") in length from the heel to the end of the blade. There is to be no measurement of the curvature of the blade on the goalkeeper s stick. All other elements of the stick are subject to a measurement and the appropriate applicable penalty. The widened portion of the goalkeeper s stick extending up the shaft from the blade shall not extend more than 66cm (26") from the heel and must not exceed 8.9cm (3 1/2") in width. 4. Protective Equipment: The goalkeeper must wear a helmet with a face mask and protective gloves. The goalkeeper will be allowed to wear regulation-size ice hockey goalkeeper pads and gloves or some reasonable facsimile thereof (i.e. street hockey pads, cricket pads, baseball glove). The leg guards worn by goalkeepers must not exceed 31 cm (12") in extreme width when on the leg of the player. All other players are required to wear helmets with face masks or shields that cover the entire face and shin guards to ensure safety. Proper athletic footwear such as running shoes must be worn by all persons on the playing surface during play. Black soled shoes are discouraged since they will mark the playing surface. Protective gloves and elbow pads are recommended. 5. Prior to each game the referees will check for proper equipment. 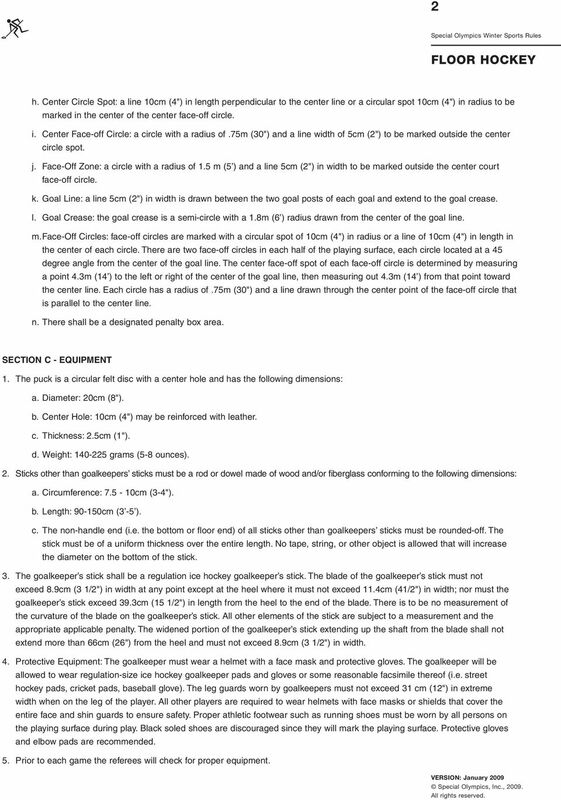 4 4 Note: If two goalkeepers are designated then the minimum they must be rotated is each game. They may be rotated on an equal basis within each game. In order to rotate on a shift basis then both goalkeepers must be dressed with full equipment to minimize delays. b) Each team must submit an approved score sheet to the scorekeeper 10 minutes prior to the start of the game. Each score sheet must include team name, head coach, all players names and individual numbers on the respective lines throughout the game reflecting the rotation of all players. One copy of the score sheet shall be kept by the scorekeeper, one by the coach of the opposing team, and one will be given back to the coach. If the score sheet is not turned in on time, a 2-minute bench penalty may be assessed to the late team. c) In case of an injury, game misconduct, or other event that requires a substitution of player/s and alters a team s line rotation, the referee will stop play. The timekeeper will stop the game clock. The team s coach will adjust the team roster/line rotation accordingly so that each player, excluding the goalkeeper, will play within one line of each other. Substitutions within a line will be allowed in the case of 2 or more simultaneous penalties. The clock will remain stopped during substitutions. 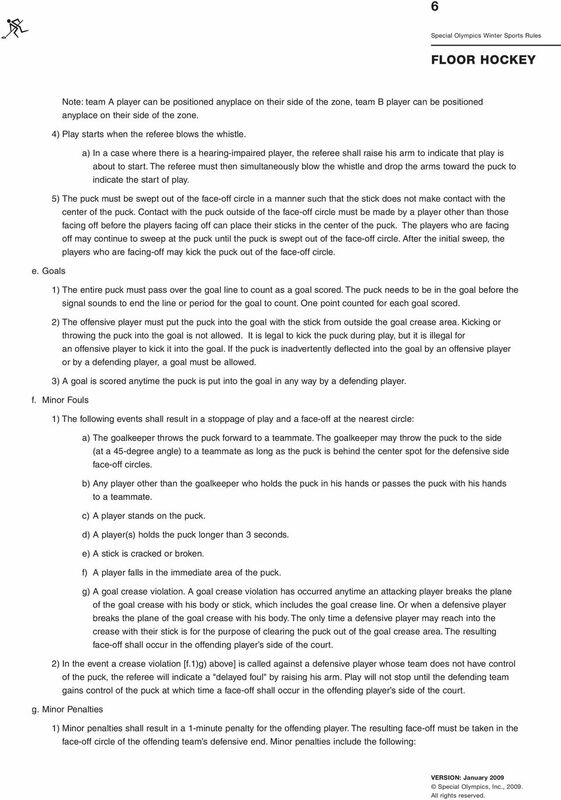 d) In case of a line change during the course of a player s penalty, a player from the incoming line will serve the remaining portion of the penalty. If the penalized player is scheduled to play in the incoming line then the penalized player must be the player to serve the penalty in this incoming line. 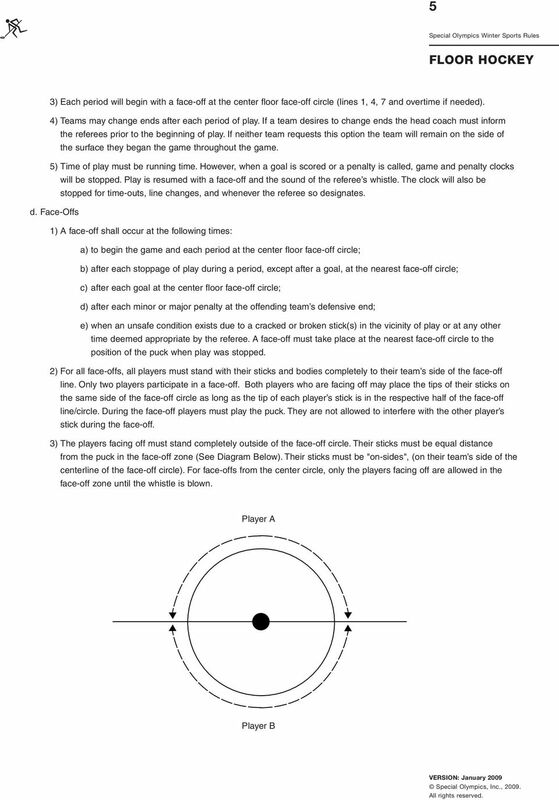 If the penalized player is not scheduled to play in the incoming line then the coach will determine which player of the incoming line must serve the balance of the penalty. 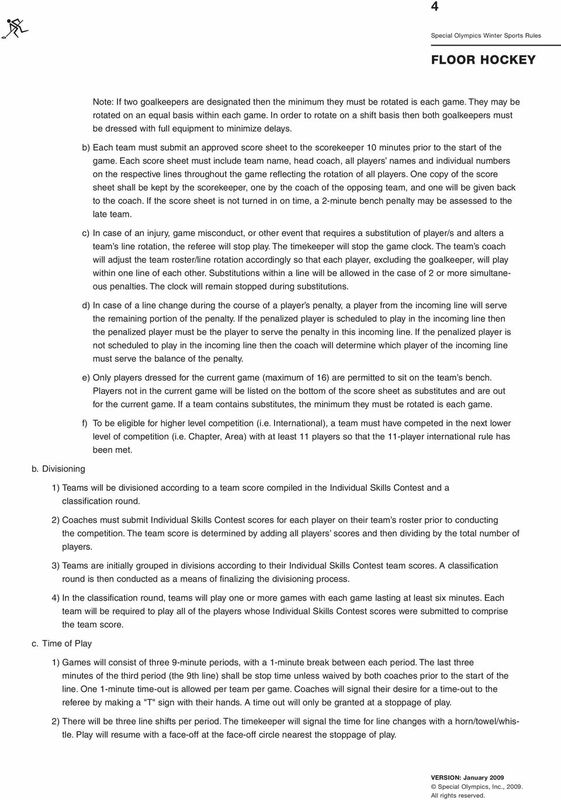 e) Only players dressed for the current game (maximum of 16) are permitted to sit on the team s bench. Players not in the current game will be listed on the bottom of the score sheet as substitutes and are out for the current game. If a team contains substitutes, the minimum they must be rotated is each game. f) To be eligible for higher level competition (i.e. International), a team must have competed in the next lower level of competition (i.e. 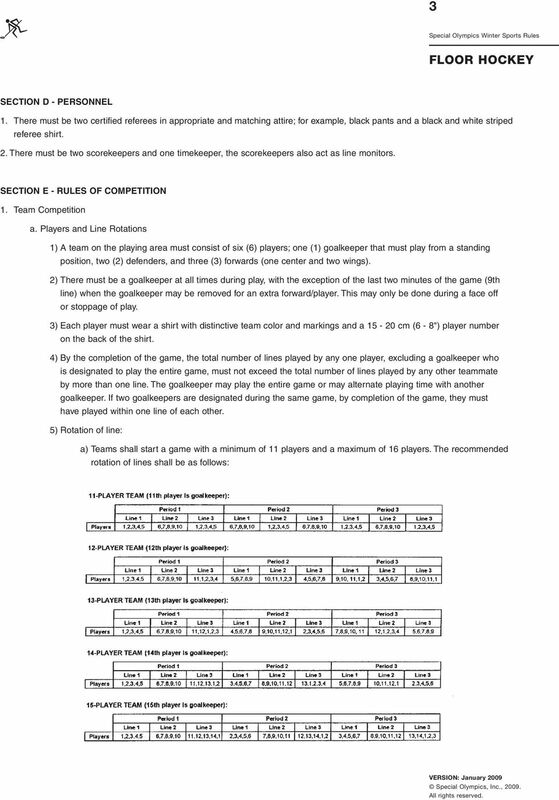 Chapter, Area) with at least 11 players so that the 11-player international rule has been met. b. Divisioning 1) Teams will be divisioned according to a team score compiled in the Individual Skills Contest and a classification round. 2) Coaches must submit Individual Skills Contest scores for each player on their team s roster prior to conducting the competition. The team score is determined by adding all players scores and then dividing by the total number of players. 3) Teams are initially grouped in divisions according to their Individual Skills Contest team scores. A classification round is then conducted as a means of finalizing the divisioning process. 4) In the classification round, teams will play one or more games with each game lasting at least six minutes. Each team will be required to play all of the players whose Individual Skills Contest scores were submitted to comprise the team score. c. Time of Play 1) Games will consist of three 9-minute periods, with a 1-minute break between each period. The last three minutes of the third period (the 9th line) shall be stop time unless waived by both coaches prior to the start of the line. One 1-minute time-out is allowed per team per game. Coaches will signal their desire for a time-out to the referee by making a "T" sign with their hands. A time out will only be granted at a stoppage of play. 2) There will be three line shifts per period. The timekeeper will signal the time for line changes with a horn/towel/whistle. Play will resume with a face-off at the face-off circle nearest the stoppage of play. 7 7 a) Holding (impeding progress of an opposing player). b) Tripping. c) Charging (running, jumping into, or charging opponent who has a clearly established position). d) Interference (impeding the progress of an opponent who is not in possession of the puck). e) Deliberately delaying the game by lying or standing on the puck or shooting it out of the playing area. f) Hooking, slashing, or kicking. g) High sticking (a player s stick must be held below his/her shoulder level at all times). h) Roughing (using any part of the body such as an elbow to hit an opponent or modify, by contact, the opponent s direction). i) Goalkeeper outside the goal crease (both feet must stay inside the goal crease area). Delayed penalty if the goalie comes out of crease and the other team has possession of puck. j) Charging from behind. k) Cross-checking (occurs when a player holds his stick horizontally and shoves a player with it). l) The goalkeeper sits, lies down, kneels on the ground, or holds the stick horizontally along the floor during play. A goalkeeper may go to the ground while making a save or to smother the puck. The goalkeeper will be warned the first time. m) Abuse of officials or unsportsmanlike conduct. If the penalty is called against a player currently in the game, the offending player will serve the penalty. If the penalty is a bench penalty the coach will pick a player currently in the game to serve the penalty. 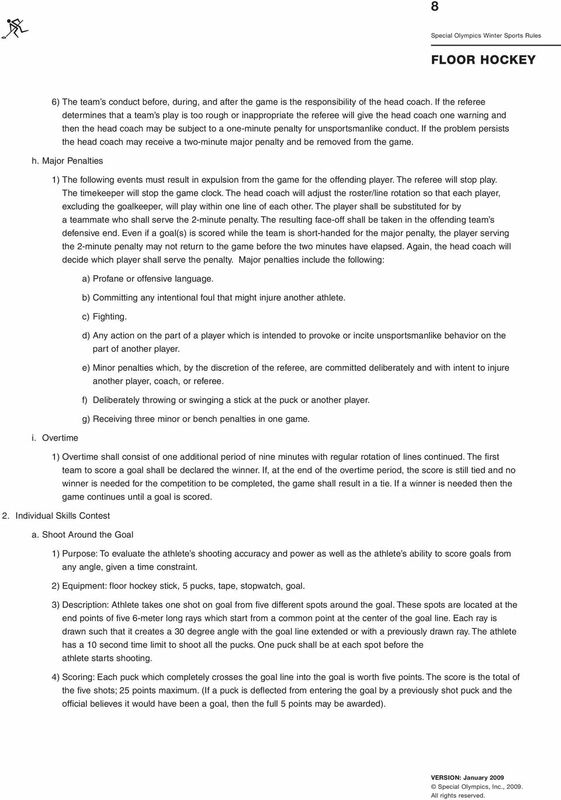 n) A team does not submit its score sheet ten minutes prior to the scheduled start of the game or coaches other than the designated "head coach" try to discuss rules and rules interpretation with the referees during the game. Again, the coach will decide which player shall serve the penalty. 2) In case of a line change during the course of a player s penalty, a player from the incoming line shall serve the balance of the penalty. 3) If a goal is scored against the team which is short-handed, the player serving the penalty may return to the game even if the penalty time has not elapsed. A team shall not be required to play with fewer than four players. If more than two players are penalized during the same time, penalties shall be served in succession. Note: Definition - "Short-handed" means that the Team is below the numerical strength of its opponents on the court at the time the goal is scored. See the following examples: a. A coincident minor penalty results in both teams playing at equal strength. Players will sit the entire penalty whether a goal is scored or not. b. Team A gets a minor penalty and is "short-handed", Team B gets a minor penalty 30 seconds later. Both teams are considered to be equal strength until the end of Team A s penalty at that time Team B will be "short-handed" for the remaining 30 seconds of their players penalty. 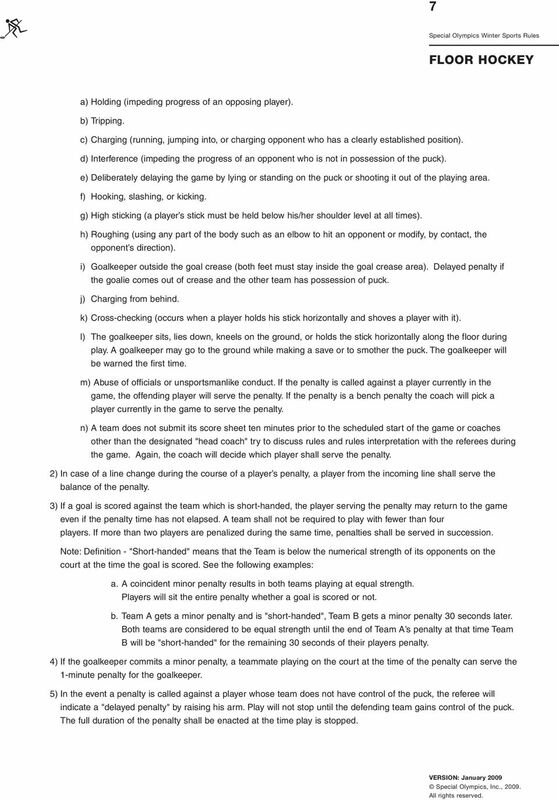 4) If the goalkeeper commits a minor penalty, a teammate playing on the court at the time of the penalty can serve the 1-minute penalty for the goalkeeper. 5) In the event a penalty is called against a player whose team does not have control of the puck, the referee will indicate a "delayed penalty" by raising his arm. Play will not stop until the defending team gains control of the puck. The full duration of the penalty shall be enacted at the time play is stopped. 8 8 6) The team s conduct before, during, and after the game is the responsibility of the head coach. If the referee determines that a team s play is too rough or inappropriate the referee will give the head coach one warning and then the head coach may be subject to a one-minute penalty for unsportsmanlike conduct. If the problem persists the head coach may receive a two-minute major penalty and be removed from the game. h. Major Penalties 1) The following events must result in expulsion from the game for the offending player. The referee will stop play. The timekeeper will stop the game clock. The head coach will adjust the roster/line rotation so that each player, excluding the goalkeeper, will play within one line of each other. The player shall be substituted for by a teammate who shall serve the 2-minute penalty. The resulting face-off shall be taken in the offending team s defensive end. Even if a goal(s) is scored while the team is short-handed for the major penalty, the player serving the 2-minute penalty may not return to the game before the two minutes have elapsed. Again, the head coach will decide which player shall serve the penalty. Major penalties include the following: a) Profane or offensive language. b) Committing any intentional foul that might injure another athlete. c) Fighting. d) Any action on the part of a player which is intended to provoke or incite unsportsmanlike behavior on the part of another player. e) Minor penalties which, by the discretion of the referee, are committed deliberately and with intent to injure another player, coach, or referee. f) Deliberately throwing or swinging a stick at the puck or another player. 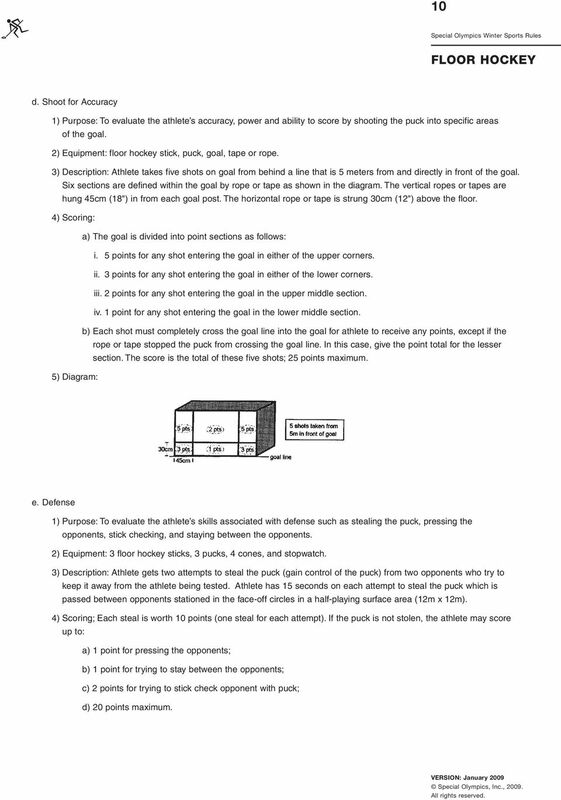 g) Receiving three minor or bench penalties in one game. i. Overtime 1) Overtime shall consist of one additional period of nine minutes with regular rotation of lines continued. The first team to score a goal shall be declared the winner. If, at the end of the overtime period, the score is still tied and no winner is needed for the competition to be completed, the game shall result in a tie. If a winner is needed then the game continues until a goal is scored. 2. Individual Skills Contest a. Shoot Around the Goal 1) Purpose: To evaluate the athlete s shooting accuracy and power as well as the athlete s ability to score goals from any angle, given a time constraint. 2) Equipment: floor hockey stick, 5 pucks, tape, stopwatch, goal. 3) Description: Athlete takes one shot on goal from five different spots around the goal. These spots are located at the end points of five 6-meter long rays which start from a common point at the center of the goal line. Each ray is drawn such that it creates a 30 degree angle with the goal line extended or with a previously drawn ray. The athlete has a 10 second time limit to shoot all the pucks. One puck shall be at each spot before the athlete starts shooting. 4) Scoring: Each puck which completely crosses the goal line into the goal is worth five points. The score is the total of the five shots; 25 points maximum. (If a puck is deflected from entering the goal by a previously shot puck and the official believes it would have been a goal, then the full 5 points may be awarded). 10 10 d. Shoot for Accuracy 1) Purpose: To evaluate the athlete s accuracy, power and ability to score by shooting the puck into specific areas of the goal. 2) Equipment: floor hockey stick, puck, goal, tape or rope. 3) Description: Athlete takes five shots on goal from behind a line that is 5 meters from and directly in front of the goal. Six sections are defined within the goal by rope or tape as shown in the diagram. The vertical ropes or tapes are hung 45cm (18") in from each goal post. The horizontal rope or tape is strung 30cm (12") above the floor. 4) Scoring: a) The goal is divided into point sections as follows: i. 5 points for any shot entering the goal in either of the upper corners. ii. 3 points for any shot entering the goal in either of the lower corners. iii. 2 points for any shot entering the goal in the upper middle section. iv. 1 point for any shot entering the goal in the lower middle section. b) Each shot must completely cross the goal line into the goal for athlete to receive any points, except if the rope or tape stopped the puck from crossing the goal line. In this case, give the point total for the lesser section. The score is the total of these five shots; 25 points maximum. 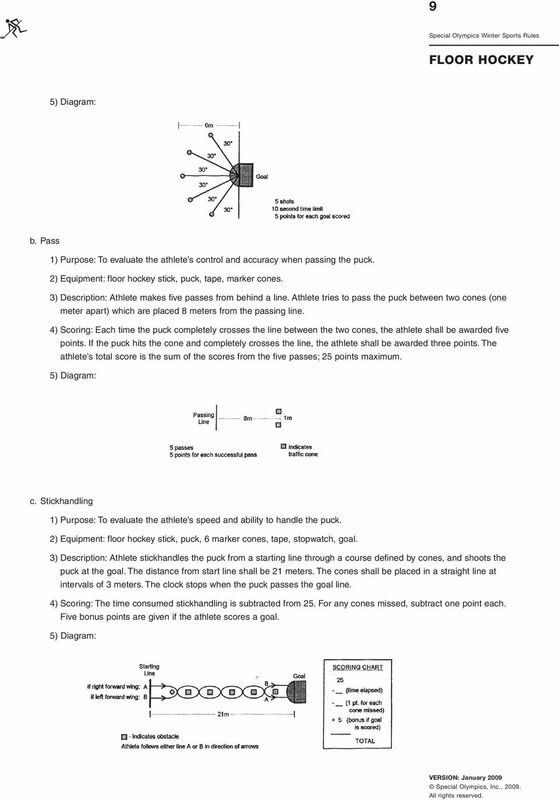 5) Diagram: e. Defense 1) Purpose: To evaluate the athlete s skills associated with defense such as stealing the puck, pressing the opponents, stick checking, and staying between the opponents. 2) Equipment: 3 floor hockey sticks, 3 pucks, 4 cones, and stopwatch. 3) Description: Athlete gets two attempts to steal the puck (gain control of the puck) from two opponents who try to keep it away from the athlete being tested. Athlete has 15 seconds on each attempt to steal the puck which is passed between opponents stationed in the face-off circles in a half-playing surface area (12m x 12m). 4) Scoring; Each steal is worth 10 points (one steal for each attempt). If the puck is not stolen, the athlete may score up to: a) 1 point for pressing the opponents; b) 1 point for trying to stay between the opponents; c) 2 points for trying to stick check opponent with puck; d) 20 points maximum. 11 11 5) Diagram: Note: Coaches should put opponents who are of similar ability on the floor at the same time. f. Final Score 1) A player s final score is determined by adding together the scores achieved in each of the five events which comprise the Individual Skills Contest. SECTION F - UNIFIED SPORTS TEAM COMPETITIONS a. The roster shall contain a proportionate number of Special Olympics Athletes and Unified Sports Partners. b. During competition, the line-up can contain no more than three partners on the court at any one time. 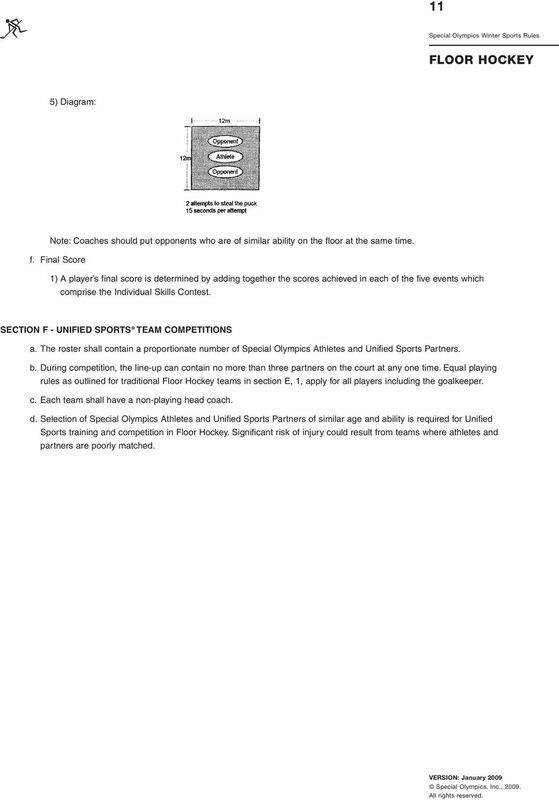 Equal playing rules as outlined for traditional Floor Hockey teams in section E, 1, apply for all players including the goalkeeper. c. Each team shall have a non-playing head coach. d. Selection of Special Olympics Athletes and Unified Sports Partners of similar age and ability is required for Unified Sports training and competition in Floor Hockey. Significant risk of injury could result from teams where athletes and partners are poorly matched.